On Saturday, I attended Collier Township’s annual Collierfest at the community center. This year, a very special award was presented – a brand new Harley-Davidson police motorcycle that township police Officer Bill Oslick won for the department by participating in the America’s 911 Foundation commemorative ride. 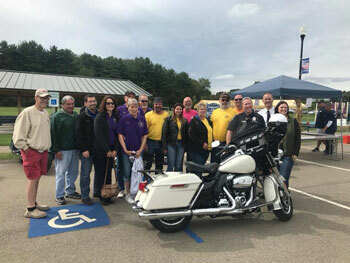 Since 2016, the township’s motorcycle unit has joined in the annual event to all three of the 9/11 crash sites in remembrance of those who served, protected and lost their lives, and to the volunteers who assisted on Sept. 11, 2001. Each escorting officer is entered into the drawing for the motorcycle.